Seger and his Silver Bullet Band have announced their 2017 Runaway Train Tour which opens on August 24 in Toledo, OH and runs through October 28 in Phoenix, AZ. These are the first dates that the band has played in over two years, going back to March 30, 2015 in Indianapolis which was the close of their Ride Out Tour. Ride Out was also the name of his last release from 2014. 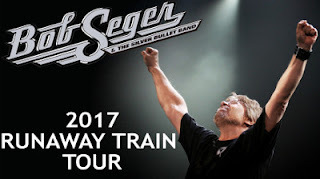 Seger told Billboard "I have a great time on stage. The thing I look forward to is playing with these people. They're so much fun to play with and be with and they make my job easy 'cause they play great and sing great." The announcement promised that additional dates would be added.